With a raised garden bed, you can grow twice as much in half the space. Mike McGrath shares tips on how to raise the garden yourself. Raise high your growing beds, gardeners! Those dimensions are close to perfect Skipper; and the most important of those dimension is width. 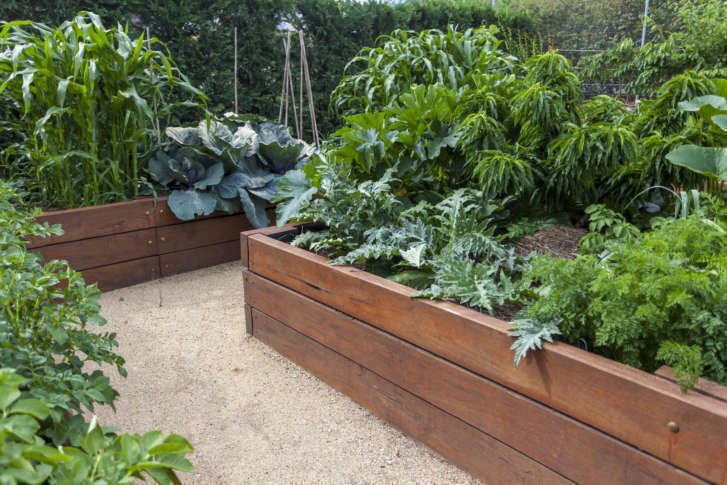 Raised beds should never be wider than 4 feet, so that you can always reach the center from either side without stepping on the soil in the bed. If you don’t step on that soil, it never gets compacted — and soil compaction is the second biggest human cause of plant death. Compacted soil also has to be tilled to loosen it up again. Tilling decreases nutrients and increases weed woes, so always follow the 4 foot rule! Skip in Warrenton is looking to build raised beds. The length is up to you (and of course, the reality of the area you have to work with), because raised beds can be as long as you want. A popular length is 8 feet, as it adheres to standard lengths of wood and you can grow quite a bit of good eating in a 4×8 bed; much more than you could in the same square footage of flat earth. Just make sure to always leave at least 2 feet of walking lane in between your beds to make harvesting and wheelbarrowing easy. And yes, Skip’s proposed 3 feet is even better! Raised beds should be at least a foot taller than the surrounding soil, Skip. That defines the area well, is tall enough to remind you not to step onto the soil and prevents creeping grasses — the biggest weed problem of flat earth gardens — from roaming their rhizomes into your radishes. And if your frames can accommodate it, the taller the better. Fill each bed with a mix of high quality yard waste compost (not composted manure), screened topsoil that’s dark in color when it’s dry (very important!) and a big bag of perlite. Perlite is the round, white, mined, glasslike mineral you see in potting soils; it greatly improves drainage and helps keep air around the roots of your plants, which is good. Do not use any of your old garden soil. It’s full of weed seeds and its poor quality is the reason you’re building raised beds to begin with! OK — so Skipper’s new beds-to-be are at least a foot high, no wider than 4 feet, as long as he wants and have at least two-foot-wide walking lanes in between each bed. Now — what about the actual raised bed frames? You can frame the beds with landscape timbers made of naturally-rot resistant materials like cedar or redwood (buy lower-quality [and cheaper] “knotty” pieces). Or you can use timbers made of a “composite” material like Trex or Azek; these molded mixtures of recycled wood shavings and plastic work just like real wood but last seemingly forever. I have beds framed with Trex timbers that are decades-old and look brand-new. But materials like fieldstone and pavers may be the best choice. They last forever and you can easily take them apart and reposition them if your needs change in the future. Whatever you do, don’t use old railroad ties — they are impossibly toxic! And don’t use old-school (“CCA”) pressure-treated wood containing arsenic. Skip in Warrenton is getting tired of fighting his native “soil” of rocks and red clay and wants to join the raised bed brigade. Now you got it, Skipper! Growing beds that are raised a foot higher than the surrounding flat ground and filled with weed-free topsoil and compost warm up faster in the spring and stay warm longer in the fall — especially if they’re framed with something like fieldstone or pavers that absorb heat from the sun during the day and radiate that heat back into the soil at night. Making the beds no wider than 4 feet, so that you can reach everything in the beds without stepping on and compacting the soil, means that the soil will stay light and fluffy without you ever having to till. You’ll grow twice as much in half the space with a garden of raised beds! Mike McGrath was Editor-in-Chief of ORGANIC GARDENING magazine from 1990 through 1997. He has been the host of the nationally syndicated Public Radio show “You Bet Your Garden” since 1998 and Garden Editor for WTOP since 1999. Send him your garden or pest control questions at MikeMcG@PTD.net.